Isolation and Characterization of Bacterial Endophytes Associated with Sago Palm (Metroxylon sagu Rottb.) in Issue Culture. Asian Journal of Microbiology, Biotechnology and Environmental Sciences, 16 (4): 877-885, 2014. Endophytes are organisms, often bacteria or fungi that inhabit the plant without causing it harm. In this study, bacterial endophytes were isolated from sago palm during tissue culture, to check whether the palm harbors beneficial bacteria. Sago palm, the plant of interest is being studied for its fast propagation because it is an merging new crop in Mindanao. Its trunk produces large quantities of starch. Two species of bacterial endophytes with known antibiotic properties were isolated, characterized, identified and confirmed. These were Enterobacter ludwigii, Klebsiella varicola. These endophytes could be further developed as biological control agents for plant pathogens. 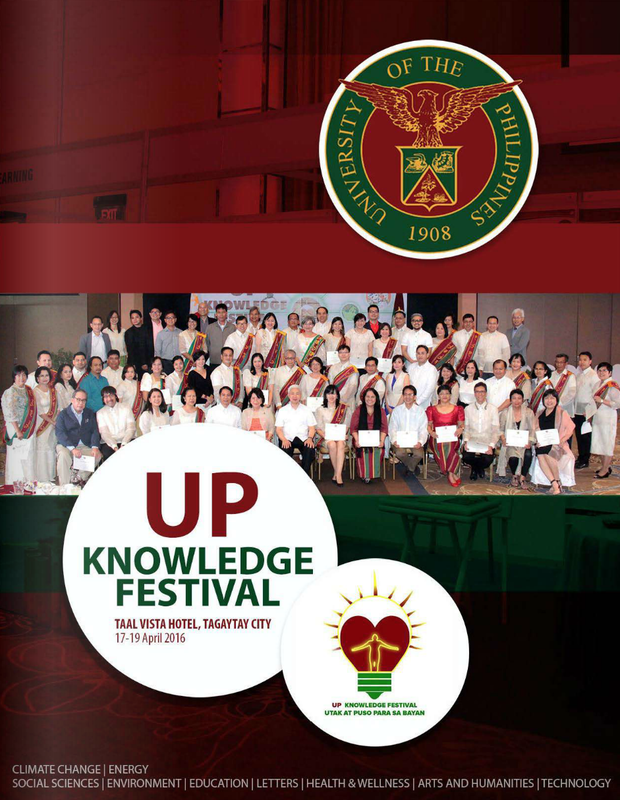 Sulu Sojourns: Photo-ethnography and Political Discourses on Four Ethno-linguistic Groups in the Sulu and Tawi-Tawi Archipelagoes. 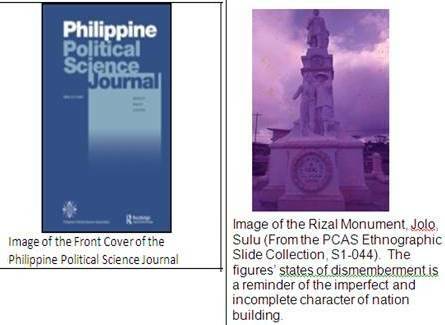 Philippine Political Science Journal, 35 (2): 136-157, 2014. Sometime in 2009, Dr. MCM Santamaria of the UP Asian Center discovered a cache of photographic prints and slides stored in one of the rooms of the old Romulo Hall. It turns out that these images were part of the ethnographic collection of the Asian Center Museum Laboratory once headed by the late Dr. F. Landa Jocano who was assisted by, among others, his staff members, Joseph R. Fortin, Manshur Bin-Ghalib Jundam and Jose B. Sabalvaro. 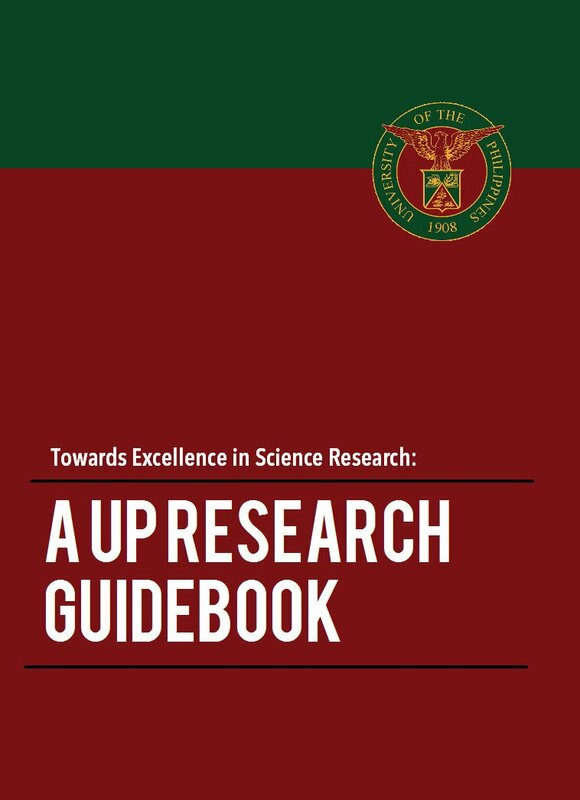 Enlisting the help of Dr. Reuben Ramas Cañete, then affiliated with the College of Arts and Letters and Mr. Marc San Valentin of the College of Fine Arts, Dr. Santamaria obtained a research grant from the UP System to help conserve, catalogue and study the collection. “Sulu Sojourns” is a study of the set of images taken during the Museum Laboratory fieldwork forays in the Sulu and Tawi-Tawi Archipelagoes in the 1970s up to the early 1980s. Some of these images found their way in PCAS and Asian Center Field Report Series publications on the Badjaw (1978), Sama (1983), Tausug (1978), and Yakan (1983). “Sulu Sojourns” looks at how photography was used to project very particular images of the nation as well as photography was used to help pursue a particular imagination of the nation. In a nutshell, the work explains how the interests of the Marcos regime, scholarship of the said period and the technology and discursive “gaze” of photography combined to create very powerful and political images of the Filipino nation. Each Symplectic Matrix is a Product of Four Symplectic Involutions. Linear Algebra and its Applications, 466: 382–400, 1 February 2015. One of the most used techniques in studying objects in mathematics is by decomposing them into objects with special properties. In this paper we study the decomposition of matrices called symplectic matrices into products of the same type of matrices with additional properties. We hope that this will help in understanding the properties of such matrices. Zinc Oxide Nanostructures Formed by Wet Oxidation of Zn Foil. Advanced Materials Research, 1043: 22-26, 2014. Reliability of the Filipino Version of the Parent Satisfaction Scale: A Preliminary Study. Hong Kong Physiotherapy Journal, 32 (2): 73–78, December 2014. Parent satisfaction is a significant indicator of the quality of pediatric health services. 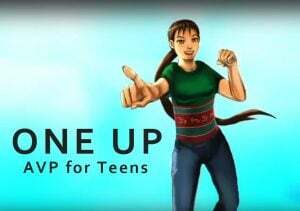 Parents are the most reliable informants of their children’s health and development and they are the one’s responsible for acquiring health services for them. It is important to know what they think about the services their children receive because this will help health care providers identify the measures they need to take to improve their services. There are several tools available to measure parent satisfaction but none are developed for Filipinos. Difficulties understanding the language of a questionnaire may negatively affect the validity of the measure. The authors translated the Parent Satisfaction Scale (PSS) by Gerkensmeyer and Austin to Filipino to allow linguistic appropriateness of the tool for use among Filipino parents. 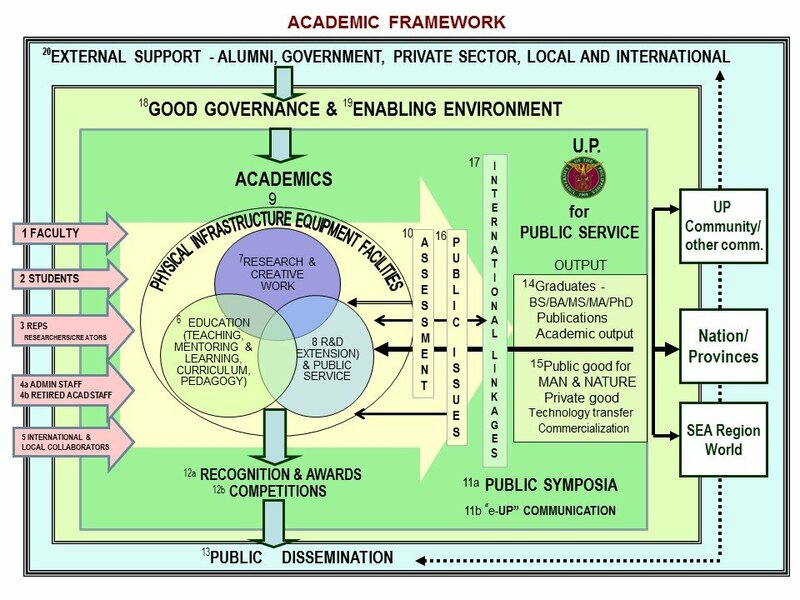 The PSS underwent a systematic process of translation and the Filipino version (F-PSS) was subjected to field testing. This was done to evaluate whether its items measure the same concept (internal consistency) and if it is reliable enough to produce the same results when administered repeatedly (reproducibility). Preliminary findings of the study support the reliability of the F-PSS as demonstrated by a high internal consistency and good reproducibility. Health professionals and other consumers are encouraged to utilize the F-PSS but with careful consideration of its limitations: the study only presents preliminary findings and further study is needed to measure its validity to further ascertain its clinical utility. Heritage-making and the Language of Auctoritas and Potestas. Cultura. International Journal of Philosophy of Culture and Axiology, 11 (2): 19-37, 2014. Heritage-making can mean many things to different cultures, wherein a wide array of cultural items, devices and values can be witnessed, and some of these are significant, yet others are considered in the balance. It is an ongoing process, which brings to light the fact that cultures and the partakers have a task in the social order and the know how to direct the way of their discourses, wherein one must deal with language games that effectively engage the participants in circulating heritage. These games are taken into account as clusters of speech acts that are classified as assertives, commissives and directives, which correspond to the three types of rule: hegemony, hierarchy and heteronomy. Under the contemporary signs of the times, heritage-making can be appropriated, communicated, substituted or even challenged by partakers of a certain culture and by way of a choice of language employed. In this context, the article specifically lays emphasis on the language of auctoritas and potestas as decisive in cultural heritage-making. “More or Less Consumption? : The Effect of Remittances on Filipino Household Spending Behavior” in Managing International Migration for Development in East Asia. Richard H. Adams Jr. and Ahmad Ahsan (editors). Washington DC: The World Bank, 2014. Non-Arrhenius Temperature Dependence of the Island Density of One-dimensional Al Chains on Si(100): A Kinetic Monte Carlo Study. Journal of Vacuum Science & Technology A, 33 (2): 021404, 6 pages, 2015. Catchy title of research: Anomalous temperature dependence of the island density of one-dimensional Al chains on Si(100): a modeling and simulation study. 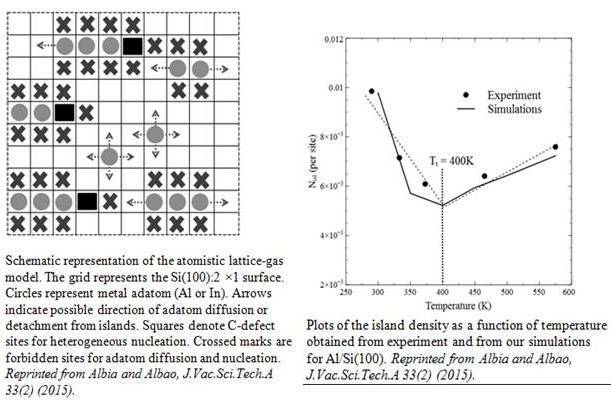 The existence of a transition temperature, above which the mean island density of one-dimensional islands grown on Si(100) substrate rises with temperature, is not predicted by classical nucleation theory, nor it is explained by the gradual removal of Al adatom from the surface — desorption— as claimed in previous works. 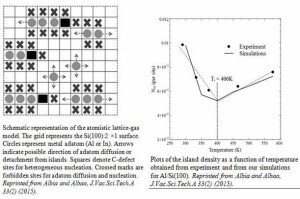 Instead, the authors propose that it is due to a combination of factors such as reversibility of island growth, presence of C-defects, adatom diffusion rates, as well as detachment rates at island ends. In addition, the authors show that the anomalous non-Arrhenius behavior vanishes when adatom binds irreversibly with C-defects as observed in the case of Indium adsorption on Si(100) surface. The Clinical Significance of Immediate Symptom Responses to Manual Therapy Treatment for Neck Pain: Observational Secondary Data Analysis of a Randomized Trial. 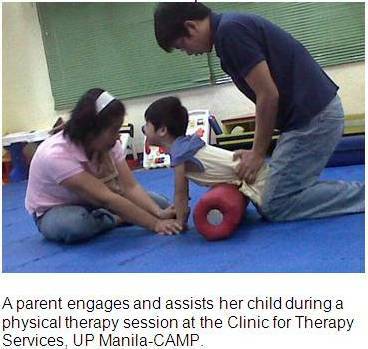 Manual Therapy, 19 (6): 549–554, December 2014. Manual therapies are commonly used in treating neck pain to relieve symptoms, restore mobility and hasten recovery (Picture 1). A common practice in manual therapy is using immediate treatment responses to inform how the patient will most likely recover and how treatment should be progressed. This observational study was done to describe the changes in neck pain treated with manual therapy and the predictive value of improvements in neck pain within sessions for longer term outcomes. We analyzed treatment responses and recovery in 181 people with neck pain, treated with neck mobilization or manipulation on four sessions over two weeks. We measured pain scores before and after treatment sessions. We also explored how pain scores are related with other treatment effects and perception of treatment benefits after three months. 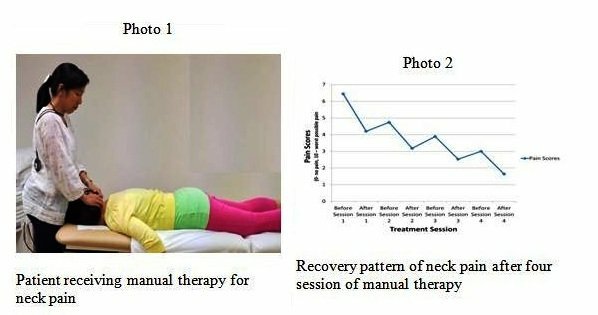 Our results show that people with neck pain who are treated with manual therapy experience a pattern of recovery that coincides with treatment and features improvement within sessions and slight relapse between sessions (Photo 2). The bigger the change in pain scores, the greater the perception of treatment benefits by the patients and the faster the recovery from neck pain. Manual therapists can use information from this study to assist patients’ understanding of recovery from neck pain. It is helpful for patients to understand that slight relapses between treatment sessions are the norm and not necessarily an indicator of poor outcome. These results also assist clinical reasoning in manual therapy practice by demonstrating a predictive value of short term treatment responses.